Frankie Fife (12) looks for an open teammate, during the first half of Tuesday’s Feb. 20 girls high school basketball sectional tournament game in Trotwood. Fife led Greeneview with a game-high 21 points in a 72-32 second-round win over Urbana. Greeneview’s Faith Strickle (33) guards Urbana’s Samantha Rooney in a Division III second-round sectional girls high school basketball tournament game, Feb. 20 at Trotwood-Madison High School. 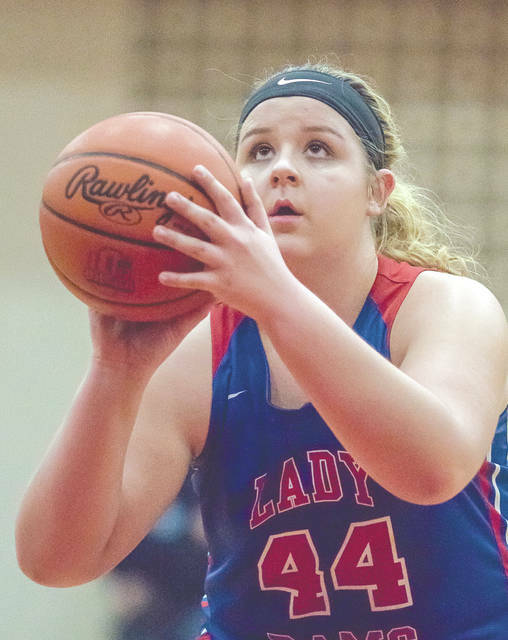 Caitlin Sweat, of Greeneview, eyes the rim while preparing to make a free-throw attempt in the first half of Tuesday’s Feb. 20 girls high school basketball sectional tournament game against Urbana. Greeneview’s Olivia Maxwell drives around an Urbana Hillclimber in first-half action from Tuesday’s Feb. 20 girls high school basketball sectional tournament game. Greeneview won the second round Division III game, 72-32. TROTWOOD — It may have been nice and warm outside, but it still took third-seeded Greeneview (22-2) about 7 minutes and 40 seconds to get warmed up for its Feb. 20 second-round sectional tournament game against Urbana. Faith Strickle canned a three-point shot from the corner to put the Rams ahead by 14-10 with 20 seconds left in the opening period of play. Upstart and No. 18 seeded Urbana had been making a game of it to that point, but Greeneview got rolling the rest of the way. 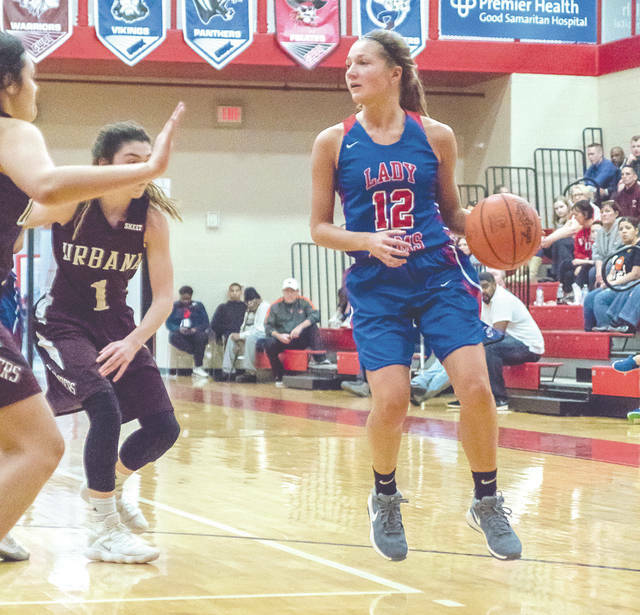 The Rams outscored the Hillclimbers 23-7 in the second quarter, and 35-15 in the second half, for a convincing 72-32 win Feb. 20 at Trotwood-Madison High School. Greeneview coach Tim Hoelle had an explanation for his Rams players’ first-quarter rust. “We gave them the week off of practice last week, just to give them some rest,” he said. “We had a lot of kids out sick, and they weren’t feeling well. So we came in yesterday for practice and just talked about being aggressive offensively, and trying to get it to the bucket for some layups. Frankie Fife led everyone in scoring with 21 points, Strickle finished with 17 points scored, Caitlin Sweat added 13, Olivia Maxwell scored eight, Sylvie Sonneman scored six points, Alexa Simpson added three, and Kayli Vipperman and Faith Rutherford each scored two in the Rams win. 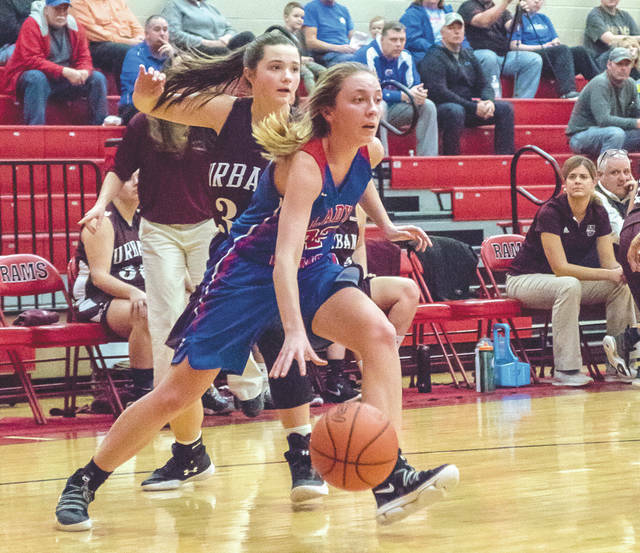 Once the margin got beyond 35 points midway through the final quarter, with Greeneview well in front 63-27, the Ohio High School Athletic Association’s new running clock rule was utilized and the game clock continued running for the final 4:06 of the contest. The new rule allows the clock to be stopped if the trailing team can get the margin within 30 points, but Urbana was outscored 7-5 the rest of the way. Junior guard Alaina Lyons led the Hillclimbers with 13 points scored, and freshman Samantha Rooney finished with 10. Greeneview will now play West Liberty-Salem (18-5) in the next round. No. 5 seed WLS defeated No. 16 seeded Indian Lake, 55-24, in Tuesday night’s late game at Trotwood-Madison. The two Ohio Heritage Conference foes will face each other in the sectional final at 6 p.m., Tuesday, Feb. 27 in Trotwood. West Liberty-Salem is the OHC North division regular season champion. Greeneview won the OHC South title. The Rams defeated WLS, 44-33, back on Jan. 4 in Jamestown. “It’s tournament time, and we know that anything can happen. We’re just going to come out and play hard. We’ll have some intense practices this week and we’ll just do what we can to be ready to play on Tuesday,” Hoelle said. 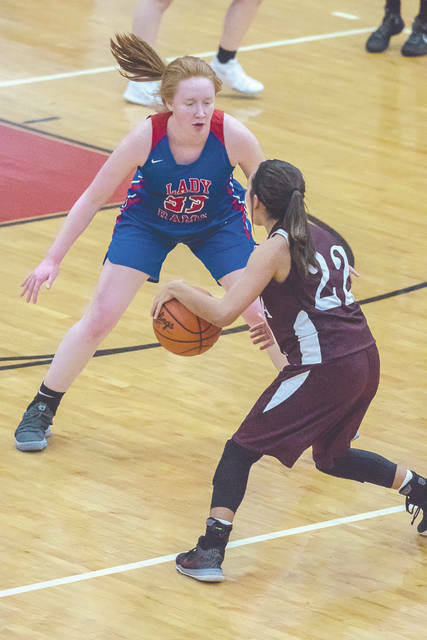 https://www.fairborndailyherald.com/wp-content/uploads/sites/50/2018/02/web1_FrankieFife12_PS.jpgFrankie Fife (12) looks for an open teammate, during the first half of Tuesday’s Feb. 20 girls high school basketball sectional tournament game in Trotwood. Fife led Greeneview with a game-high 21 points in a 72-32 second-round win over Urbana. https://www.fairborndailyherald.com/wp-content/uploads/sites/50/2018/02/web1_FaithStrickle_PS.jpgGreeneview’s Faith Strickle (33) guards Urbana’s Samantha Rooney in a Division III second-round sectional girls high school basketball tournament game, Feb. 20 at Trotwood-Madison High School. https://www.fairborndailyherald.com/wp-content/uploads/sites/50/2018/02/web1_CaitlinSweat_PS.jpgCaitlin Sweat, of Greeneview, eyes the rim while preparing to make a free-throw attempt in the first half of Tuesday’s Feb. 20 girls high school basketball sectional tournament game against Urbana. https://www.fairborndailyherald.com/wp-content/uploads/sites/50/2018/02/web1_OliviaMaxwell_PS-1.jpgGreeneview’s Olivia Maxwell drives around an Urbana Hillclimber in first-half action from Tuesday’s Feb. 20 girls high school basketball sectional tournament game. Greeneview won the second round Division III game, 72-32.